I’m annoyed for multiple reasons. Let’s discuss them, shall we? Having seen the trailer a few years back it was with excitement that this documentary came along. Primarily because of the inclusion of Danny Trejo, who has built a big career for himself in his later years. (Danny Trejo as a tough guy, yes, Liam Neeson, no). His story is but a small addition to this detailed look into the growth of the tattoo in the 20th century. 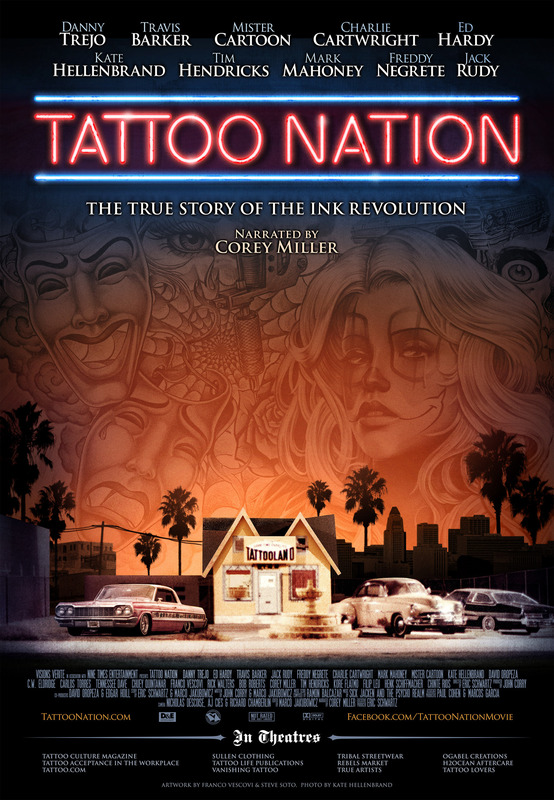 From the prison style to the black and grey to the full body colour suits that Ed Hardy brought over from Japan, director Eric Schwartz gives us a previously unseen insight into how tattoos have become acceptable, maybe even a mandatory part of culture from the frowned upon image they used to have. The Mexican, Chicano culture embraced tattoos as a way of claiming their individual identity and stamping their culture onto their skin. The body as a canvas to express creativity can become art in one of its purest forms. We’re not talking about random Chinese symbols here, more the element of story telling, self expression and the extent to which this is possible. Gone are the days of going into a parlour and only getting to choose from templates (anchors, swallows etc), now it is a big business with clients having meetings with their tattooist and many discussions before putting ink to skin. No longer the pissed up, drop in style of old (although I’m sure that style still exists in some places), tattooing has now been elevated to a common part of society. The transition between the tribal style being disparaged to becoming badges of honour and ways of expressing oneself has been exponential in the last 30 years and is now an accepted part of culture as an art form and so it should be. Some of the greatest tattooists are exactly that, artists. This documentary is well worth a watch giving the viewer a previously unseen look into the recent history of this interesting art-form.